The engineer "Prince Ham Iono" felt that through this stone he could invent a lot. King Khufu gave a miniature model of his design for the Great Pyramid. Alabaster Material However since this is a beautiful lovely Egyptian antique piece ,it's unavoidable ,and it's satisfactory to use. And hope to see you soon. Photos Show. It is a very exquisite Chinese porcelain vase,of double gourd form,the body coated with deep green glaze all over,bottom marked "Da Qing Wan Li Nian Zhi" six blue characters.Very good condition,hard to find now! Extraordinary beautiful piece of the finest quality glass hand made in the Bohemian. region of the Czech Republic in the style of Art Nouveau or Art Deco. Vase belongs to the elite of glass masters in the Czech Republic. Net weight:0.77 kg. And hope to see you soon. Photos Show. In the arts, historical tradition based its' inspiration from the Greek and Roman antiquity. In the 1800's an influx of Greek architectural motifs were displayed in the Neo-Classical images based on the Imperial Roman style, and was a reaction against the preceding Rococo era. Body of the hat tube. Age: probably of the Qing dynasty period. P lease always use your own expert. Galle Cameo Vase, Persimmon Red over Goldy-Orange, Reproduction? This is a beautiful Galle vase in a gold-orange color with a persimmon red layer on top and carved into leaves and cherries. I don’t know if this is an old Galle or newer reproduction. In flight through the green marsh grass in the vase sub-layer. Has a silver lip. Designed by: Harald Nielsen 1892-1977. Stamped with GJ stamp fro 1933-1944, Denmark, Sterling, 925S and 757. Sterling silver 925S. This item is preowned but in excellent condition. Such a Lovely Vintage Large Bronzed Cast Metal Brass Victorian Ladies Lace-Up Boot Vanity Vase FirePlace Long MatchStick Holder!Heavy,with Ornate Details,it is in Great Vintage Condition,with No cracks or tarnish,but has Shirley written on bottom and it measures 93/4"tall x 43/4"wide across top x 81/4"long across bottom x 23/4"wide across bottom!. And hope to see you soon. height:9 4/9";. Usually a dispatch to the. Antiques is my trade. I fair people and always-on communication. And hope to see you soon. net weight:0.98 kg. And hope to see you soon. net weight:0.45 kg. height:7 2/5";. Pot, Qianlong marked on base. Age: Qianlong marked probably of the Q ing Dynasty period. P lease always use. Get images that. Size: 5.51 " high 5.12 ” width 1.19 lb. make Supersized seem small. HUGE Pair French Antique Marble urns vases. It is a very exquisite Chinese porcelain vase,of bottle form,the body coated with black glaze all over,the bottle is shaped like a pear.The bottom marks "Da Ming Tian Qi Nian Zhi" six blue characters. This is a beautiful Steuben art glass vase made in the 1920s or 1930s. It is topaz gold in color with a swirled texture. It is in excellent condition though it has a little scratches on the bottom. A beautiful pair of sevres - style porcelain and bronze vases. Decorated, over the blue coblat background, with raised gold and hand- painted romantic scenes. SEVRES-STYLE PAIR OF PORCELAINE VASES. We have a family tradition in dealing with antiques. Floriform Art Sculpture Vase. Identified to be Kralik. this lovely double vase. Stunning as shown. A Beautiful Antique. Frosted and Clear Glass. It has mostly frosted glass. with an edge chip on the. VINTAGE PIER 1 STUNNING ART GLASS VASE BLUE AND GREEN - EXCELLENT CONDITION! THERE ARE A FEW TINY DARK SPOTS IN THE GLAZE - OTHERWISE IT IS IN EXCELLENT CONDITION! THE VASE IS 11 1/2" (29.5 CM) TALL. A GORGEOUS, HEAVY BEAUTIFUL QUALITY VASE! THE BASE IS 3 1/2" (9 CM). The vase is in excellent condition for its age with no breaks or prior repairs seen. There is also a firing crack to the root effect base to the back of the vase. This is stable and is not readily visible unless inspecting for it (see photos). The vase, Qianlong marked on base. Age: Qianlong marked probably of the Qing dynasty period. P lease always use. make Supersized seem small. Get images that. Hello, you are viewing my sale for an Original Miniature Hand Painted Asian Wood Resin Vase with Highly Detailed Colorful Patterns Throughout. This small vase weighs approx. The purple and black colors with the engraved patterns throughout are stunning. And hope to see you soon. net weight:0.44 kg. EXQUISITE TALL HAND CARVED WOODEN VASE - EXCELLENT CONDITION! THIS BEAUTIFUL AND EXOTIC HAND CARVED WOODEN VASE FROM THAILAND HAS A GORGEOUS PATTERN AND IS IN EXCELLENT CONDITION! THE VASE IS 19 1/2" (49.5 CM) TALL. THIS ONE IS SPECTACULAR! THE BASE IS 4" (10 CM). And hope to see you soon. net weight:0.74 kg. THE SET IS IN PERFECT CONDITION. SIZE 10 1/2" H, 9 3/4" H, DISH 6 1/4" W, 2 1/8" H.
And hope to see you soon. Photos Show. net weight:0.57 kg. 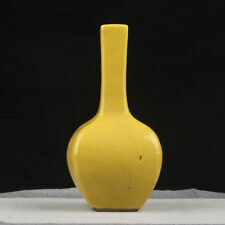 The collection is a rare old Chinese vase,the exterior are all coated with green and golden glazes,smooth surface. The body have a incredible design with a long neck.Bottom written "Da Qing Kang Xi Nian Zhi".